The music, the lights, the people. They all add up at an electronic dance music (EDM) event to create an experience that takes us away from our everyday life. We get to dance and escape for a bit. “But, after a few shows, this novelty wore off. You weren’t as excited anymore; you knew what to expect. So what does one do?” asked one music psychology enthusiast. Well, if you’re the pioneers in live performances of electronic music like Boreta (Justin Boreta), edIT (Edward Ma), and Ooah (Joshua Mayer), aka The Glitch Mob (above), you look for new technology that lets you further break down the wall between the performers and the crowd. “The Glitch Mob are consistently pushing the boundaries of live electronic performance, with The Blade 2.0 another of their ingenious creations once again putting their live show in a league of its own,” says Broadway World. Blade 2.0 is the new custom-made live performance rig that follows (obviously) Blade 1.0. The new tour also brings a custom stage designed by Martin Phillips, the same man behind Daft Punk’s legendary Pyramid on their iconic 2006/2007 Alive tour; he’s also worked with the likes of Kanye West, Nine Inch Nails and others. The band also collaborated with Dell and Alienware on the project to provide the elite computational power needed to perform their music the way it was intended to be received with the utmost precision and sound quality. As gamers, in addition to musicians, The Glitch Mob have been fans of Alienware and started working with the brand in 2011. Impressed with the performance of those systems, they began looking at more Dell technology for the Blade 2.0. They were using hacked Apple iPads and Macbook Pros in the Blade 1.0, but felt limited by their ecosystem and infrastructure. The systems were barely powerful enough to keep up with the demands of the live show and weren’t updated or refreshed frequently enough. 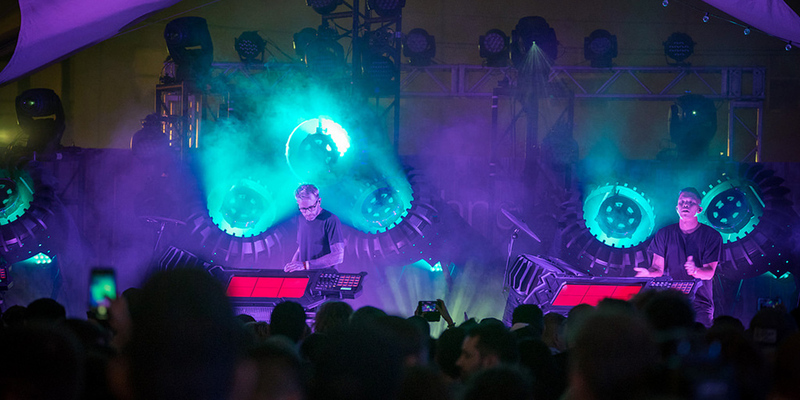 At their 2015 New Year’s Eve show, The Glitch Mob used three Dell XPS 18s for the first time in a live performance in front of 19,000 fans. Success then gave them confidence that Dell would be a reliable technology partner for a monumental 36-date 2018 world tour on a next-level stage. Traditionally, a stage has a conceptual barrier between those who are on it and those in front of it that is referred to as the fourth wall. What’s going to be really fun about Blade 2.0 is that it breaks that imaginary barrier. For venues and events where Blade 2.0 won’t fit, The Glitch Mob will perform DJ sets on Dell XPS 15s.